Martha Berry thanks Miss Veitch for her interest in Berry. She writes about Berry's Protestant, Christian focus, but says it is non-denominational. She says that each of the students are part of some kind of church once they leave. Berry informs Miss Veitch that Berry accepts full or partial scholarships all year long. 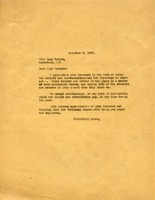 In this letter Martha Berry sends Mrs. Gildoresleeve phamplets from the schools to give out in her talk to the missionry society. Martha Berry then explains that the schools are Christian but nondenominational.